Highlander 3rd Generation Forum dedicated to the discussion of 3rd generation Toyota Highlanders. Toyota Nation Forum : Toyota Car and Truck Forums > Toyota Truck, SUV and Van Forums > Highlander Forum > Highlander 3rd Generation > Did dealer overfill my engine oil? Did dealer overfill my engine oil? Engine oil changed at 20K mile ToyotaCare service. 22K+ miles now. 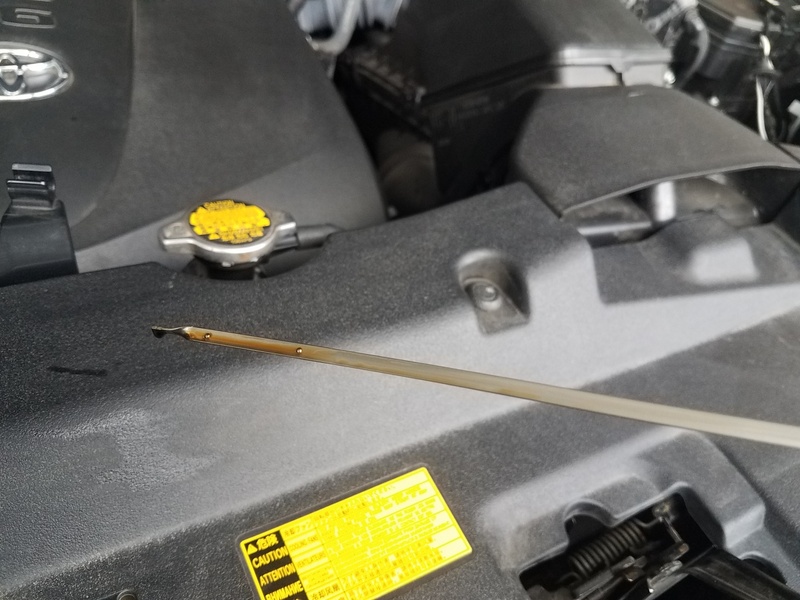 Checked dipstick oil level after driving for 15 mins, wait 20 mins. The level is ABOVE the MAX dot. The difference between the dots is one quart, so if it is 1/4 quart overfilled that is no problem. However, you may be getting a bad dipstick reading. 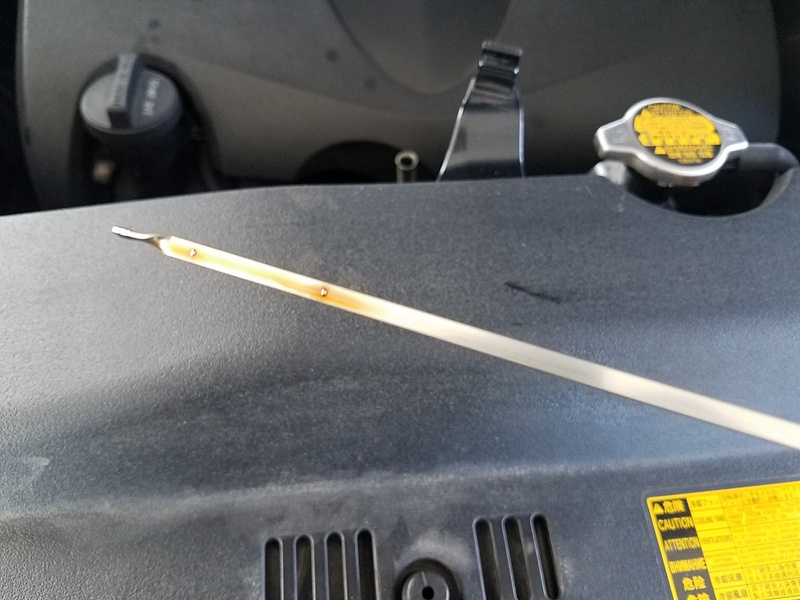 Trying letting your car sit for a couple of hours, and pull the dipstick out one time and immediately read it (do not wipe it off and put it back in for a new reading). Each time you pull the dipstick, it drags oil up the tube and makes reading more difficult. This seems to be more of a problem with newer vehicles for some reason. stvotw, cb91710, dchobo and 1 others like this. ...pull the dipstick out one time and immediately read it (do not wipe it off and put it back in for a new reading). Each time you pull the dipstick, it drags oil up the tube and makes reading more difficult. This seems to be more of a problem with newer vehicles for some reason. When I first learned to drive, I was taught to wipe the dipstick and put it back for the new reading... I guess it's a new way now! The issue now is the oil level has to be checked with the engine warm. I suspect in the past people checked their oil straight after driving , saw it was low and put more oil in, when the oil level was supposed to be measured cold and hence over filled.With the current system, max at warm engine , I suspect it is more important to keep level between the marks. Try driving until your engine is completely warmed up and then go to a level spot, garage or forecourt , if completely level , not driveway as they often have a slope and wait only 10 minutes or so then check it. Wiping the dipstick and re inserting, ignore the dragged oil and look for the clean cut off on one side or the other. Totally agree with the method for checking the oil and I think it's that the newer cars use thinner oil which makes it harder to see and it tends to not establish a sharp cutoff on the dipstick. Actually, as I read the 2017 OM, page 522, it says the oil quantity between "low" and "full" is 1.9 qts. Here I am assuming they are referring to the range between the two dipstick dots. And, assuming further, if there really is close to 2 qts between the dots, as opposed to the more normal 1 quart (like on my Accord), any distance over the top dot could be more than what you think (or less, depending on the linearity of the true volume vs the shape of the oil pan). I really think the only way to get an accurate read on what is really too much above the top dot is to change your own oil and overfill by exactly 1/4 quart and see where that sits on the dipstick, unless we can get some official word from a Toyota engineer. The purpose of waiting 5-10 minutes after engine shut-down is so oil can drain back to the pan after it's been running. Manufacturers don't want you checking your oil when it's hot for fear of you burning yourself. Some manufacturers think it's best to check when hot because of oil expansion. It is true oil will expand when hot, but it's minuscule. Some manufacturers (VW) thinks it matters. You do NOT want to overfill the oil. This may cause the crank whipping the oil. whipping the oil causes it to thicken up and can destroy an engine. I thought waiting to check was to let the oil drain back into the pan to get a more accurate reading? I would assume that the minimum level is conservative, so anywhere between min and max should be fine, my vehicle was delivered with the oil about 30% below max, so I have left it at that and would only put more oil in if it is near the minimum, in older cars I would top it up to or near the the max when cold. Gas station attendants at one time used to ask wen gassing up if I wanted my oil checked, ridiculous as the level on a hot engine would be low and adding oil risked over filling.Most likely result of that amount of extra oil is a leaky camshaft cover? Yep, I'm sure that many folks incorrectly checked their oil level this way. No, it was not supposed to be checked this way. ... With the current system, max at warm engine , I suspect it is more important to keep level between the marks. Try driving until your engine is completely warmed up and then go to a level spot, garage or forecourt , if completely level , not driveway as they often have a slope and wait only 10 minutes or so then check it. Wiping the dipstick and re inserting, ignore the dragged oil and look for the clean cut off on one side or the other. It has nothing to do with temperature these days. In the "old days" the dino oil that was in use was much more viscous (thick) and you needed to warm up the engine to get the oil at it's running temp viscosity (especially in colder climates) - you were supposed to check the oil level at operating temp. Those gasoline station attendants weren't doing anything wrong. They used to check water/coolant at the same time , accidents happened and so that was discontinued. Regardless if you want to check the oil warm or cold, you have to give sufficient time for the oil to drain back into the sump and 2 minutes is not really long enough. Last edited by Nzott; 04-05-2019 at 02:48 PM. Ummm, OK, except this has nothing to do with checking the engine oil level. ... Regardless if you want to check the oil warm or cold, you have to give sufficient time for the oil to drain back into the sump and 2 minutes is not really long enough. 2 minutes is long enough, but if you want to wait for 5 minutes be my guest. That has nothing to do with dino oil. Dino 5w-30 at 30 degrees flows the same as synthetic 5w-30. Where synthetic shines are the extreme temps that regular dino oil has a problem with. I've never seen any manufacturer say to check the oil at operating temp. Even cars from the 60's and 70's. They did say to CHANGE the oil at operating temps because the hotter oil would trap the dirt better and when you drained the oil it would remove more of the dirt then cold oil did. I'm talking about 30w (not 5w-30) oil "back in the day". I believe I did say that these days it has nothing to do with oil temp. But back when I was a teenager you were supposed to check the oil after the engine had been running (warm or hot didn't matter, but not cold); after multi-viscosity oil was common you were still supposed to check the oil after the engine had been running for a bit and then stopped for a couple of minutes to get an accurate reading. That's what was commonly taught back then (you know, when high schools had auto shop classes), but YMMV of course. ... They did say to CHANGE the oil at operating temps because the hotter oil would trap the dirt better and when you drained the oil it would remove more of the dirt then cold oil did. "They" still say this, but I'm sure many companies have changed their recommendation so that they don't get sued by people who get burned by hot oil, not because it's not true any longer. What level does the oil come to on the dipstick when you put the quoted oil capacity at refill? I would think there is no reason to ever fill to the max mark , maybe the OP should take it back to the dealer and tell them they think it is over filled. Last edited by Nzott; 04-05-2019 at 05:31 PM.